To accelerate the transition to digital revenue, executives at nearly all of these newspaper companies agreed on one thing: Their advertising sales staffs needed to change. One of the broadest findings in this research, indeed, is the degree to which all of the executives talked about the need to re-train and re-tool sales staffs that had been trained to sell print advertising. In the data and interviews, PEJ heard how this effort to change the culture of the business side of the newspaper industry involves everything from hiring digitally skilled sales people, to re-training the staff, to changing the way the people who generate revenue are incentivized and compensated. The significance of these efforts cannot be overstated, according to the executives interviewed. And for the most part, the industry wants to handle this transition internally rather than turning to outside companies to help sell its digital space. At the papers that provided data, on average, 88% of their digital ad revenue came from their own staff as opposed to outside sales networks. This desire to transform their sales staffs, rather than turn to outsiders to sell also presents a challenge. One executive said the biggest difficulty facing his company is "execution," particularly by the sales staff. "This is where the game will be won," he explained, "in the streets with small and mid-sized businesses." Another executive said his sales people frankly did not know how to sell all the products they were offering. Executives also described numerous obstacles they face in trying to effect cultural change in their sales teams. At nine of the 13 companies participating in this study, executives indicated they had experienced difficulty recruiting digitally fluent ad sales people. One reason, they admitted, is the perception of newspapers as a deeply troubled business. A number of other executives told us they were still trying to figure out how to best integrate digital-only sales people with their traditional sales personnel. In small markets, digital sales staffs may have an even greater challenge because they need to explain to potential advertisers what these new digital advertising approaches are and why they are worth trying. Sales people, in other words, are tasked with selling both the concept and the product-at least until businesses become better acquainted with the new world. But whatever the difficulties, changing the culture of sales is clearly a major priority for these companies. Of the papers that provided data, 33 reported that they were putting a priority on hiring digital salespeople. This was even true at almost 90% of the smallest papers (circulation under 25,000). In addition, 84% of all the papers responding said they had instituted a formal digital sales training program at their papers. In the same vein, 89% of the papers that provided data have changed the way they track and evaluate the performances of their staffs, and three-quarters (76%) said they had changed how they incentivize and compensate their sales staffs. The executives interviewed by PEJ confirmed that their companies were heavily engaged in those areas. For all this, most of these papers are still largely print first operations, or print and digital together, when it comes to the composition of their sales staffs. Sales people concentrating largely on digital are a distinct minority. On average, papers deployed the largest percentage of their sales staffers, about half of them, to primarily sell both traditional and digital advertising. 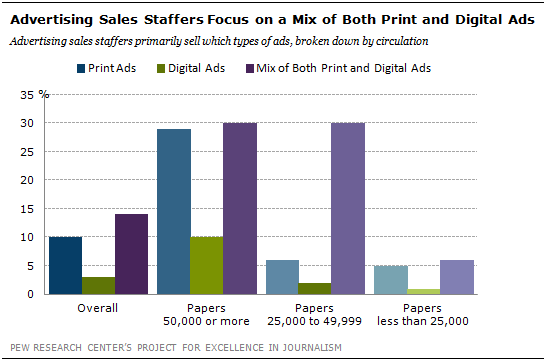 About a third of the sales staff primarily sold print ads. 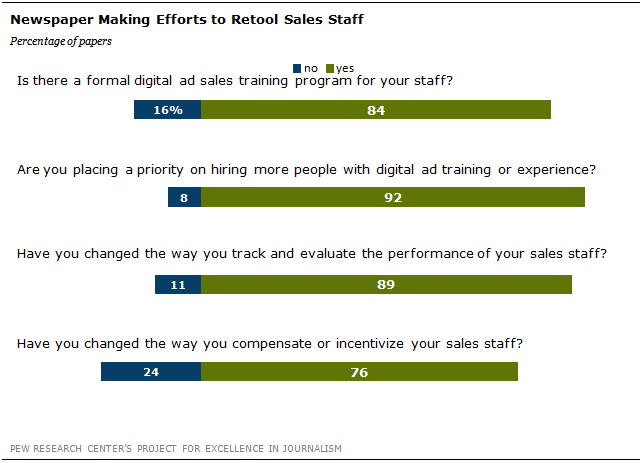 The fewest number of reps, about one-tenth of the sales staff, were primarily selling digital. On average, of the papers studied, papers had one digital ad rep for every three print ad representatives. Just four of the papers reported they had at least as many reps primarily selling digital as were selling primarily print. To make this kind of dual structure work, in which most sales people are expected to sell both print and digital ads, a number of papers are trying change the tracking and compensation of their sales staffs with the clear goal of encouraging more digital selling. There are "minimum requirements in digital sales built into the commission plan," one paper reported. "Legacy reps have specific digital targets and can’t earn full bonus without it. Digital-first reps are hired into a separate group," explained another paper. "The reps are paid 20% commission on all digital sales, whereas they are paid around 8% for print sales," was another response. "We pay them 10% of the net that our publication keeps on all digital revenue streams," reported another daily. One of the tasks for newspaper companies, according to the executives, is figuring out how to integrate their sales staffs with the goal of pushing forward on digital. A January 2012 report by Borrell Associates called "Assessing Local Digital Sales Forces" found that newspapers, along with yellow page companies, have been the "most aggressive in retooling for digital sales." But it also said that the debate over how to compose the modern media sales staff is still ongoing. The Borrell report concluded that as more organizations decide that "a single sales force can do it all," the percentage of online-only ad reps has actually dropped at legacy media companies-which include newspapers, television and radio-by 23% in the past two years. PEJ also found signs of uncertainty. One executive said his company had gone back and forth on the issue of how much to integrate the print and digital sales teams and how much to create separate units. At another company, an official said the interaction between legacy account executives and digital salespeople is still a work in progress, and can differ from newspaper to newspaper within the company. Another explained that his company is now training digital salespeople to teach their print reps to begin conversations about transitioning their clients to digital. At that point, the digital salespeople are brought into the discussion. A number of companies talked about using that kind of "digital closer" to consummate deals with advertisers. At the same time, some executives spoke about the difficulties and frustrations in trying to hire digital ad staff for an industry that has fallen on hard times and that, in some cases, doesn’t offer the kind of compensation needed to attract top talent. The Borrell study found that starting salaries were on average, about $9,000 higher for digital-only account executives than for those selling both legacy and online, because the "bounty is higher…for good internet sales reps. It’s getting harder to hire reps who are well-schooled in things like SEO, SEM, mobile advertising and social media." Retaining those sales people can prove difficult as well. One executive complained that his organization spends time and energy training digital sales people only to see them depart, in effect, turning his company into a temporary training ground.